No "Bah - hum bug" here, just humming factories! "...In the U.S., there’s been a notable acceleration in orders and shipments of capital goods. Investment in equipment and software increased at a 10.4% annualized pace in the third quarter, the fastest in three years, according to the government’s calculation of gross domestic product. Monthly figures show the strength is carrying into the fourth quarter..."
Companies that recognize the future potential are planning to realize their potential by improving productivity with new manufacturing equipment. If you're not planning for new business, you may be on the cusp of losing some business to those around you that are investing in new methods. 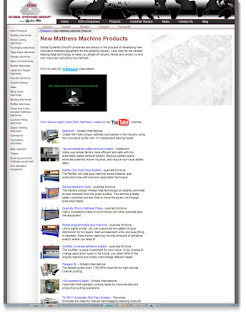 There are changes ahead for the mattress industry and manufacturing will change accordingly. Take a look at some new ways GSG can help you profit in this new era of mattress manufacturing at our New Products web page. Here you'll find cutting edge mattress production technology designed to prepare you for the booming changes ahead.